When installed properly, metal roofs have many advantages compared to wooden and asphalt varieties. However, even a long-lasting and durable roof like a metal one can be damaged by severe weather conditions or incorrect use. If the problems are significant, it is highly recommended you consider a roof replacement or hire metal roofing constructors to help with recovery. For the majority of cases, several spot repairs can be done on your own. Fix minor corroding by sanding and scraping off the rust, and priming the roof with special metal primer and a rust inhibitor. Clean rust from the areas inside and outside the hole, and prime it prior to any other manipulation. Then apply a metal coating, which matches with the color of the roof. Remove cracked or loose caulking, then clean up the area and apply liquid rubber, reinforcing it with self-adhesive seam tape. 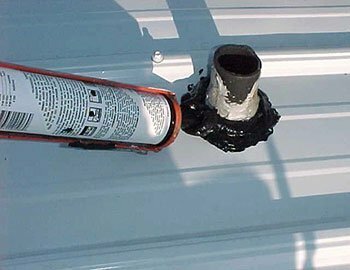 Pay special attention to this part of the repair, as old caulking around roof penetration areas is the most common cause of leaks in metal roofing. Identify the locations of leaks on the roof. There are several options of how to seal them. The first is to apply urethane roof cement over the leaking area, using a putty knife. Another thing you can do is apply a solar seal or a waterproof flashing membrane, which will be especially useful in sealing the leaking flashing. Re-screw loose fasteners and replace corroded ones. Do not forget to cover them completely with a layer of caulk or liquid rubber. 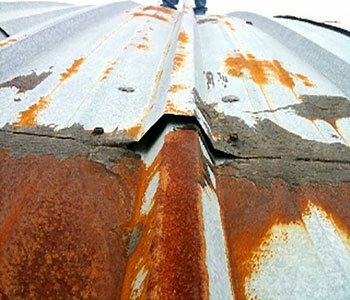 Unlike other types of roofs, metal roofs rarely require repair. Thus, the cost of metal roofing will pay off over the years.